This is the complete account of one of the most remarkable regiments in the history of the U.S. Army, written by a retired lieutenant general who served with airborne outfits during World War II and the Korean War. The 187th Infantry Regiment, known as “Rakkasans,” have fought in every major American military conflict from World War II to Afghanistan and Iraq. They were chosen by Gen. Douglas MacArthur to be the first wave of troops to occupy Japan, were the only airborne unit in the Korean War, made history at the Vietnam War’s Hamburger Hill, and made a grueling helicopter assault during Operation Desert Storm. Includes 30 rarely-published photos. UPDATE: This book is SOLD OUT. Sorry! This book — half social history and half recipes — recaptures the history and spirit of the dining-car experience and serves up entertaining details and sumptuous foods to readers interested in railroads, food, or social history. Railroad passenger food service peaked in 1930, when nearly 1 million meals were served daily. Recipes for over 325 meals from nearly 50 railroad lines can be prepared quickly at home and in small kitchens. More than 150 illustrations. 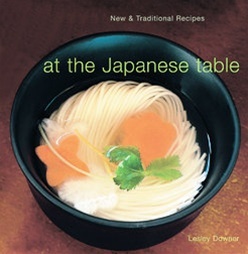 For a lecture on railroad history, the University of Southern Mississippi made refreshments using recipes from this book. Mark Twain was the most famous American of his day, and remains the most revered American writer. The book — an essential companion to Ken Burns’ PBS documentary “Mark Twain” — examines not merely his famous novels, stories, travelogues, and lectures, but also his diaries, letters, and 275 illustrations from throughout his life. This biography takes us from his boyhood in Hannibal, Missouri, to his time as a riverboat worker — when he adopted the sobriquet “Mark Twain” — to his varied careers as a newspaperman, printer and author. Follows him from the home he built in Hartford, Connecticut, to his travels across Europe, the Middle East and the U.S.
With essays by Russell Jocelyn Chadwick, Ron Powers and John Boyer, and an interview with frequent Twain portrayer Hal Holbrook, this book provides a rich portrayal of the first figure of American letters. Beautifully designed! 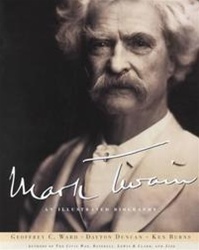 “This is more than a lavishly illustrated companion book to the Mark Twain PBS series. National Book Critics Circle Award winner Geoffrey C. Ward, Dayton Duncan, and Ken Burns have produced a cogent, colorful portrait of the man who forged our national identity in the sentences he spun,” writes Amazon.com. 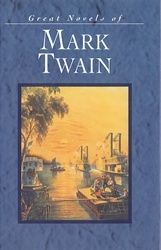 “Excellent though the brisk narrative may be, the book’s greatest pleasures are the extensive Twain quotations; no one has topped his description of the Mississippi River, and he had a salty remark for every occasion (charged an outrageous fee for a boat ride on the Sea of Galilee, he cracked, “Do you wonder now that Christ walked?”). Mark Twain (1835-1910) has achieved fame and a literary following throughout the world for his irreverent humor, realistic depiction of life on the Mississippi River and memorable characters and scenes from mid-19th century America. Beginning life as an apprentice printer, he became a journeyman printer and then a steamboat pilot on the Mississippi until the Civil War brought an end to travel on the river. After serving briefly as a volunteer soldier and a short stint of work in a silver mine and as a reporter, he began to write and travel. His famous novel “The Adventures of Tom Sawyer” comes from his own boyhood experiences in a town on the Mississippi. Its sequel “The Adventures of Huckleberry Finn” is considered to be his masterpiece. This is a facsimile of the 1899/1910 edition. Illustrations. When former Chicago Tribune newspaper editor Jim Squires became a horse breeder in bluegrass Kentucky, no one believed he would making a living. But Squires had been raising horses for 20 years, including equine athletes. 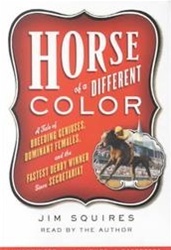 This is Squires’s rollicking tale of how a novice in the world of Kentucky horse culture did more than merely stay in business: he brought together the stallion and mare who produced Monarchos, the colt who won the 2001 Kentucky Derby. Read a sample of this book on before you purchase it. Squires lays bare the close-knit and secretive world of the thoroughbred community, tweaking the self-important owners at the Keeneland and Saratoga auctions, and skewering the preening trainers at Churchill Downs and Gulfstream Park. Black and white photos. “The idea that I could get one all the way to the Kentucky Derby is strictly a fairy tale, and someone with a greater understanding of life than I have will have to explain how I bred him,” Squires told PBS Online NewsHour. 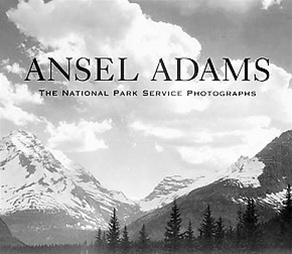 In 1941 Ansel Adams was hired by the U.S. Dept. of the Interior to photograph America’s national parks for a series of murals that would celebrate the country’s natural heritage. Because of the escalation of World War II, the project was suspended after less than a year, but not before Adams had produced this group of breathtaking images. These stunning photographs of the natural geysers & terraces in Yellowstone, the rocks & ravines in the Grand Canyon, the winding rivers & majestic mountains in Glacier and Grand Teton national parks, the mysterious Carlsbad Caverns, the architecture of ancient Indian villages, and many evocative views of the American West demonstrate the genius of Adams’s technical and aesthetic inventiveness. Perhaps the single best-kept secret about our National Parks is the underwater realm that they include: millions of acres of submerged lands, only a small fraction of which has been explored by divers. From geysers on the bottom of Yellowstone Lake, to the coral reefs of the Dry Tortugas, to steamers sunk in the frigid waters of Isle Royale in Lake Superior, to the kelp forests of the Channel Islands, the National Parks have much to offer the diver. Almost all 61 NPS areas with significant water holdings are of some interest to divers. This guide introduces divers and others interested in water sports to this dimension of the National Parks, such as snorkeling rare coral reefs; shipwreck diving and underwater archaeological sites. Color photos and detailed maps. National Parks Traveler used this book as a reference for the Top 10 favorite diving and snorkeling parks. Kids ask the greatest questions! Is the Grand Canyon cursed? Why are there so many bugs here? Do park rangers feed the animals? 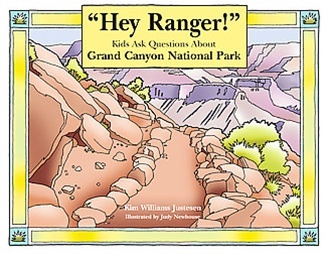 This book answers the real questions — some smart, some silly — that kids ask Grand Canyon National Park rangers every day. Filled with fascinating facts and ready-to-color illustrations, this fun and educational guide offers hours of entertainment for explorers of all ages.